No doubt you have heard the phrase “leave no trace” and such like. The aim of such sayings, of course, is to leave a place in the same state as you found it. Normally people apply this to their campsite, clearing up their fire scar and taking home all the litter they brought in. This, and I am sure you will agree is the least you should do. However the more I think about this little phrase “leave no trace’ the more it seems an impossible task. As soon as my saw cuts a sapling to make a peg for a tarp, I have left my mark. Leave no trace also seems, to me at least, to fly in the face of the other well-known phrase of “The more you know the less you carry”. A phase often spouted at people with huge backpacks new to Bushcraft carrying more kit then they will ever need. By applying these phrases without thinking about the bigger impact on the natural environment leads people into the trap. 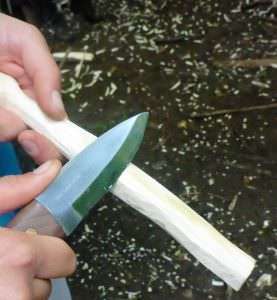 For example; I know how to make a tent peg in the woods with my knife and saw, so I won’t carry tent pegs – This fits perfectly with the know more carry less. So when I head to the woods put up my tarp and make my peg, I have left my trace. The same with stoves. You might think that by having a metal stove which raises your fire off the ground is better for the natural environment and helps you leave no trace. Surely though it is far better to have that fire on the ground, well managed and cleared away than to buy something that has been made overseas shipped halfway across the world. I’d argue that the stove has far more on an impact on our planet then your little fire will ever do. Which leads me nicely onto my next point. To truly appreciate, understand and respect something you must participate fully with it. We’re not talking about a quick stroll round the woods here folks. We’re talking about Bushcraft, Wilderness Living. What we’re talking about the world we inhabit and its wild places and our connection to them. The notion that one can somehow spend a week, a weekend, a night in the woods or any wild place without leaving a trace is not only wrong but extremely misguided. Leave a trace, leave your mark. We all do. But make yours a single coppice shoot from that hazel stool, a handful of cobnuts, a few pine needles. If you’re there for a week, make a stool so you have a comfortable place to sit. You might find that by gathering, making, and using things from your surrounding environment you not only gain immense satisfaction, but also a new understanding of what is necessary and the true value of things. That camping stool made from polluting plastic polymers doesn’t seem so comfortable after a while. Some will argue that all this is very idealistic and lovely, but with such an overpopulated nation if we all went out and took a few cob nuts, pine needles, and that hazel branch there wouldn’t be much left for anyone to enjoy afterward. While I appreciate fully that there are places so sensitive and important that they need very strict protection; I am not talking about those places. What I am talking about is the in-between places. The hidden stream amongst the willows on Dartmoor. The perfect camp between the gnarled pines in the Cairngorms. The vast secluded coppices of Sussex. All we need is more respect and understanding of these places. I don’t want to live in a world where the wild is a place we observe whilst sticking to the way-marked path. The only way we can truly protect wild places is by them meaning something to us. Without direct participation in those places, without its dirt under our fingernails, its fruits in our stomach, its deadwood keeping us warm and its leaves keeping us dry, I fail to see how we will ever really care or understand enough to protect them. What I am trying to get at is to follow these sayings without thinking about the larger scale or bigger picture is the wrong way to go. We should be thinking more about balancing these two opposing phases, maybe a better phrase would be – just because we can, does not mean we should! I carry tent pegs so I don’t cut trees when wild camping, I have my fires on the ground which I then clean up. I’ve learned a little about trees and woodlands and how they grow, so my understanding of what I can take and what I should not is improved. I source my carving wood from fallen trees, snapped limbs or even the local tree surgeons. Tapping birch can be done by just a small pruning cut on a branch rather than boring in to the tree with a drill! Source you’re kit from people in the UK who make things by hand in small batches. Yes, you may pay more, but I can assure you it will last so much longer and be more of a joy to use than any cheap mass produced equipment will ever be. Even better, make it yourself, or at least have a go. Then you might just appreciate why these things cost what they do. This is where “Leave no trace should be changed to leave as little trace as possible. Go out enjoy the wild places, that’s what they are there for and next time you head to the woods think about the bigger environmental impact and now because you know more maybe you will carry that little extra! Summer is well and truly here and with it comes an increase in popularity of the humble bivvy bag. While an option in winter many, perhaps understandably prefer to stick to tents. When it comes to summer, however, there’s not a lot that can beat the experience of sleeping out in a bivvy bag. In this blog, we’re going to look at the benefits of the bivvy, run through a few options of bivvy bags and then provide you with a description of the bivvy experience that you can have on one of our weekend bushcraft courses. As always, please feel to read the whole blog or skip to the section that interests you the most. Which bivvy bag is for you? In this section, we’re going to take a look at the benefits of the bivvy. Keep in mind though that these are just our opinions, everyone experiences the outdoors in different ways. A bivvy bag gives you the ability to sleep in places where you just couldn’t pitch a tent. Tuck up behind the rocks close to the summit of the mountain or relax, on your inflatable mat, and in your bivvy bag on a stretch of beach. A word on sleeping anywhere, wild camping is illegal in England and Wales outside of Dartmoor, although it may be unofficially tolerated elsewhere. If you do choose to go bivvying on Dartmoor, elsewhere in England/Wales or in Scotland then make sure that you have the skills to leave absolutely no trace. Your presence should not impact on the environment in any way, leave your campsite as you found it and carry out all rubbish – even if it isn’t yours. As great as tents are, and they certainly have their place, they do place a barrier between you and the environment. With a bivvy bag though, no such barrier exists. You can remain warm, and most importantly dry, inside your sleeping bag, inside your bivvy bag, while totally immersed in nature, watching the stars as you fall asleep. We will look at the weight of bivvy bags in the next section but generally speaking they are lighter than a tent. What is certain is that at the lower end of the market a bivvy bag will weigh in much, much lighter than a tent. What this means is that your overall kit weight is lower, helping you to make up more miles during the day. Ah outdoors kit, always a topic that generates a lot of discussions. The opinions in this blog are just that, opinions. Each person will have their own preferences when it comes to kit and decisions can really only be made with experience. Also, no one piece of kit will do for all situations, the demands on your kit in a summer in the UK are going to be very different from the demands of a Canadian winter. One final point of note, Wildway Bushcraft do not benefit from any of these companies or products – we don’t make any money if you chose to buy one! 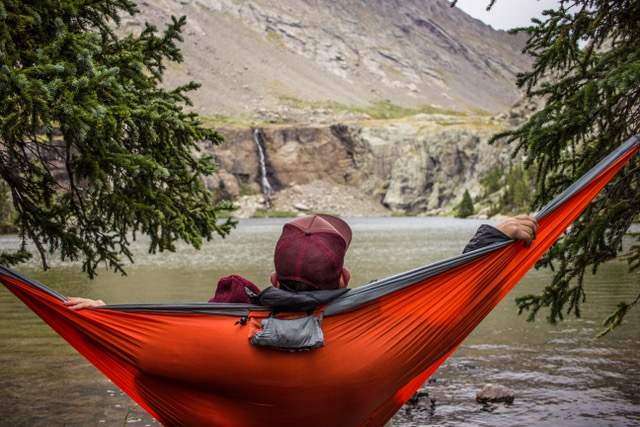 Snugpak have a, deservedly, good reputation in the outdoors world. Their bivvy bag is great from the UK weather. It weighs in at 300 grams, is fully waterproof and breathable. 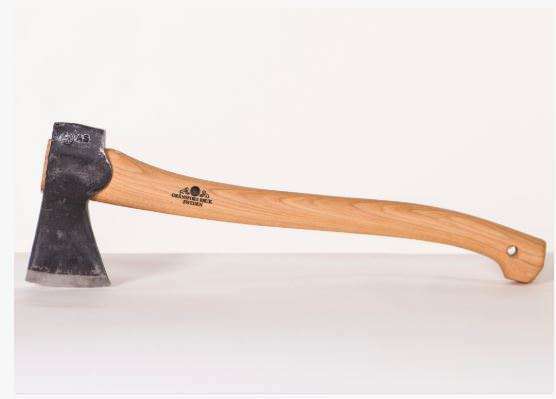 The standard version measures 228 cm long though an extra large version is available. It retails for around £70. Alpkit’s Hunka and Hunka XL are fully waterproof and breathable bivvy bags weighing in at 330 grams and 490 grams respectively. The XL measures 235 cm in length while the standard measures 215 cm. The Hunka retails for around £48 while the XL goes for £65. The Survival Zone bivvy bag from Rab weighs in at a very light 422 grams and measures 240cm in length. Fully waterproof and breathable with a very small pack size the Rab Survival Zone retails from near enough £95 making it one of the most expensive on this list. Army surplus bivvy bags, British and Dutch seem to be popular, are a very cost-effective way to start your bivvying adventures. Hooped bivvys, that is bivvy bags with one short pole forming a half-hoop over the head in order to create more space in the bag, are popular design styles in this genre. There is a huge range of army surplus bivvy bags out there and price, weight, and quality vary hugely. Go and visit your nearest army surplus store for a better understanding of what would suit you. 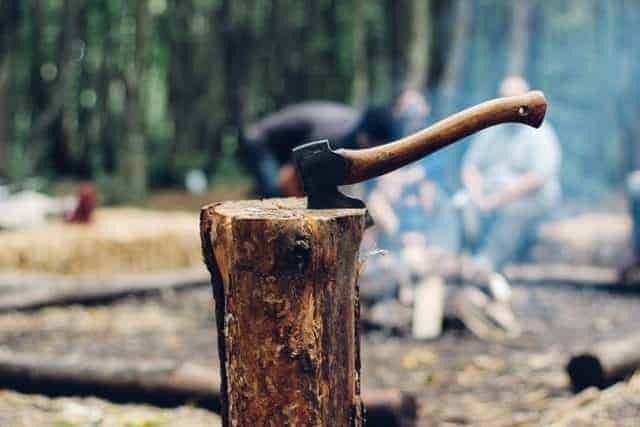 The first thing to note is that our weekend bushcraft course is not a survival exercise. If there is anything that you’re uncomfortable with just let one of our instructors know, likewise you are free to bring a tent to sleep in to help you get accustomed to the woods or to go the whole hog and sleep out under the stars. So, what can you expect, it terms of bivvying, on our weekend bushcraft course? 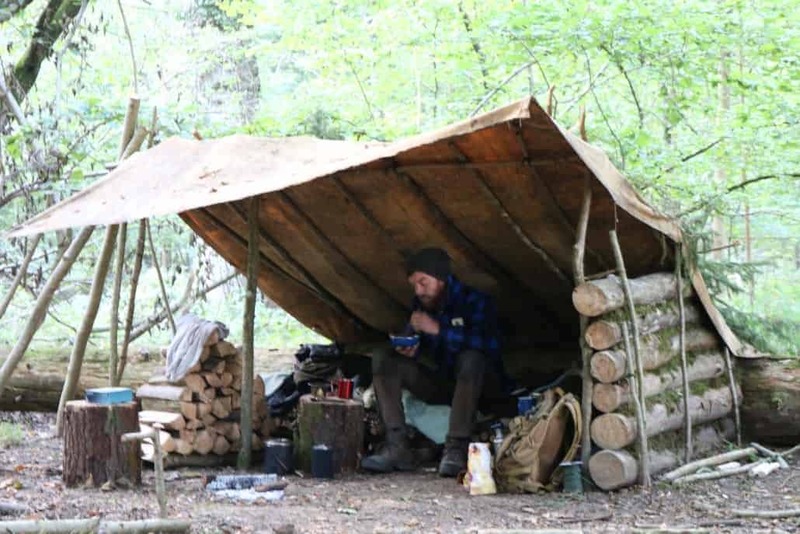 The second evening of our weekend bushcraft course will, among many, many other things, give you a chance to sleep out in a shelter that you have built yourself. This is a great opportunity to sleep out without a tarp, close to a fire, truly in amongst nature. 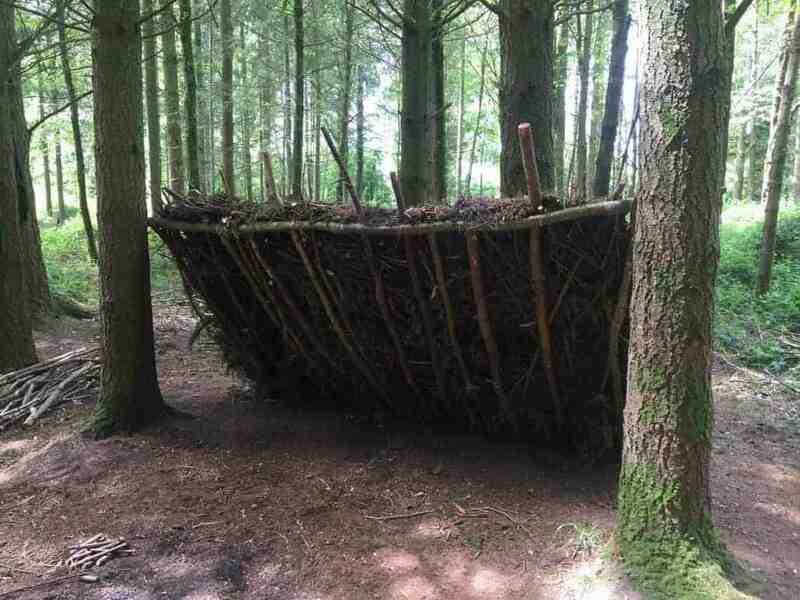 At Wildway Bushcraft, we teach bushcraft, not survival. We’re all about living in harmony with nature not about overcoming it. That’s why our weekend bushcraft courses focus on your learning if there is anything that you’re uncomfortable with, let our instructors know and they will do their best to help you. So, if you would rather sleep in a tent than under a tarp, that’s okay with us. We’ve already mentioned quite a few bivvy bags that might suit your needs, what follows here is a list of other kit that you might find useful when bivvying out in the woods. Use the directional arrows to navigate other posts that might be of interest. Hazel knows where she’ going. Bushcraft is something that is open to all the family, and foraging is a great place to introduce bushcraft skills to younger children. Remember the golden rule of foraging though – NEVER EAT ANYTHING UNLESS YOU’VE POSITIVELY IDENTIFIED IT AS SAFE. This rule needs to be stressed even more if you’re introducing children to foraging, driving home the importance not to eat anything unless they’ve shown it to an adult first. Read on to learn more about foraging for all the family. First, we’re going to take a look at the legalities and ethics behind foraging in the United Kingdom. However, the Wildlife and Countryside Act of 1981 states that it is illegal to uproot plants without the land owner’s permission. It is also illegal to forage and uproot plants in areas of special scientific interest. The legalities around foraging in Scotland are covered by the outdoor access code. Like England, Wales and Ireland though it is illegal to forage on sites of special scientific interest. For more information please see the Scottish outdoor access code, this is also a great resource for understanding the legalities surrounding wild camping. That’s the legalities out of the way. 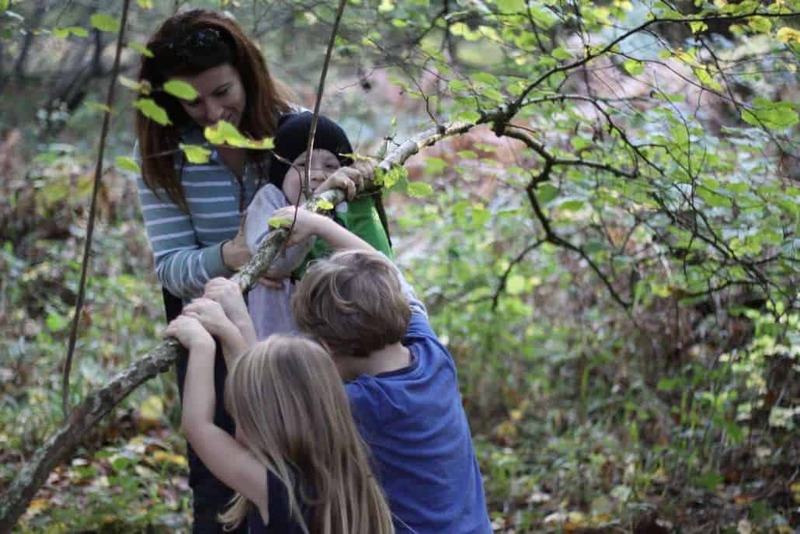 It’s great to get children involved in foraging but, it goes without saying, that you make it absolutely clear that they are not to eat anything that has not been identified as edible by an adult. The spot that you choose to forage in will largely be dictated by two factors – what land is available for your use and what type of food are you hoping to find? The latter will, of course, be largely driven by the season. In terms of land, some of the best places to forage in the UK are in hedgerows and woodland, luckily enough most of us are not too far away from either. At this time of year in the UK, the earth is starting to shake off winter and the first signs of spring are emerging. What follows is obviously not an exhaustive list of foragables in the UK at this time of year but rather a highlight of some of the most commonly found spring plants. Dandelions are very commonly found throughout the UK. What most people don’t realise is that they are edible. The plant (all of it) can be eaten raw or cooked and make an excellent addition to salads. Stinging nettles might be one of the UK’s most prevalent plants. While they are well known for stinging the unaware they also make good tea. Make sure that you wear gloves when picking them and aim to pick the tips, these are the tastiest bits. At the basis of foraging is a close connection with where our food comes from. It’s important for children to understand this harmony with the wild and the fact that salad doesn’t naturally come pre-washed and bagged. This understanding will not only help children overcome any worries that they might have about eating food, identified as safe, but it will also teach a respect of nature. After all, bushcraft at its heart is about being in harmony with nature. Like most things in life, foraging is best learned with a mixture of theory and practical knowledge. Get the books out with your children and run through the pictures together of edible plants that you are likely to encounter out in the wild. Run through the key features of these plants, what distinguishes them from surrounding plants and any similarities that they may share with inedible plants that you might also find. Foraging doesn’t have to be about being totally self-sufficient, it’s highly debatable whether that is even possible in the UK. Rather, it can be about incorporating wild foods into everyday foods. Go out and see what you can find that can be incorporated into a salad or stir-fry at home. By adding in wild foods to those that you are eating at home you help to break down the barrier between foods that children might consider ‘wild’ and those they consider ‘normal’. Here’s some more information for people that are looking to get into foraging as a family. Written by Wildway Bushcraft founder and director John Boe along with Owen Senior, Bushcraft – A Family Guide and Adventure in the Great Outdoors is a great resource for families looking to get, not only into foraging but also into bushcraft. Foraging on Scotland’s rivers – Learn how to forage along Scotland’s rivers in this blog post. 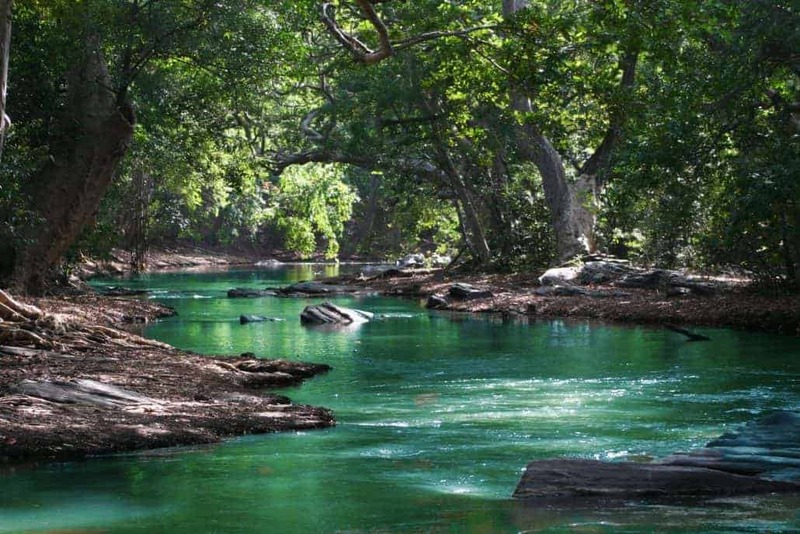 How to Source and Purify Water – Purifying water is a key bushcraft skill, learn more here. How to Cook for the Camp: An Intro to Eating Well Outdoors – learn how to organise your camp and cook over a campfire in this blog post. There is little better than getting away from it all and paddling the rivers of beautiful Scotland. However, knowing what to pack for a long canoe trip (and keeping your kit dry) can be a difficult undertaking. In this latest blog, we’re going to show you how to decide what to pack and how to keep it dry. Fancy canoeing the wilds of Scotland? 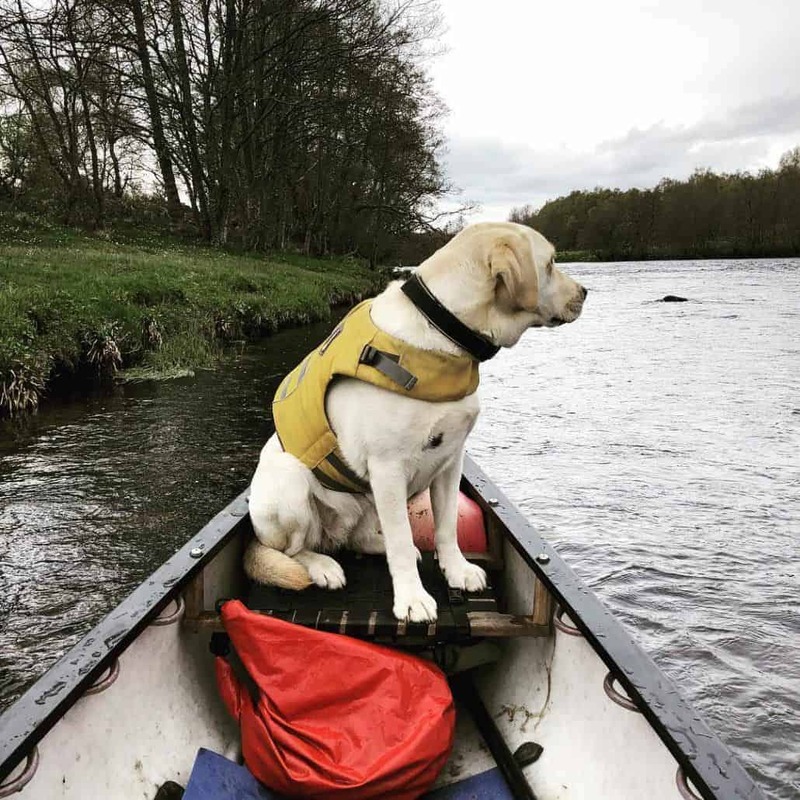 Then our River Spey expedition is for you. Click here for more details and to book your place on this once in a lifetime trip. Please feel free to read the whole blog or click on the links below to take you to the relevant section. Correct clothing is essential for any outdoor trip. You need to balance warmth with comfort, and wear materials that dry quickly – so no cotton on the river. For an introduction to the layering system read our blog on reading the weather in the UK. Here’s our essential guide to clothing for long distance canoe trips. Go for thin, wicking, base layers made of a material such as Merino wool. Go for a thin yet warm second layer, such as a light-weight fleece. On top of your second layer, you will need a fleece jacket or something similar to help keep the warm air in. Finally, for your top, you will need a thoroughly waterproof (not water resistant) jacket that will also act as a windbreaker when out on the river. In addition to your thermal base-layers, you will need waterproof trousers, these can be swapped out for your normal walking trousers when you’re off the river. Alternatively, you can invest in dry trousers. A warm pair of gloves and a hat are essential on the river. Your hat not only needs to keep you warm but also needs to keep the sun off your neck, remember it’s possible to get sunburned even if it’s’not summer. You will need a spare of all of the above, this is known as your ‘ditch kit’. The idea being that, should you fall in, you should be able to get dry and warm and then continue your journey. 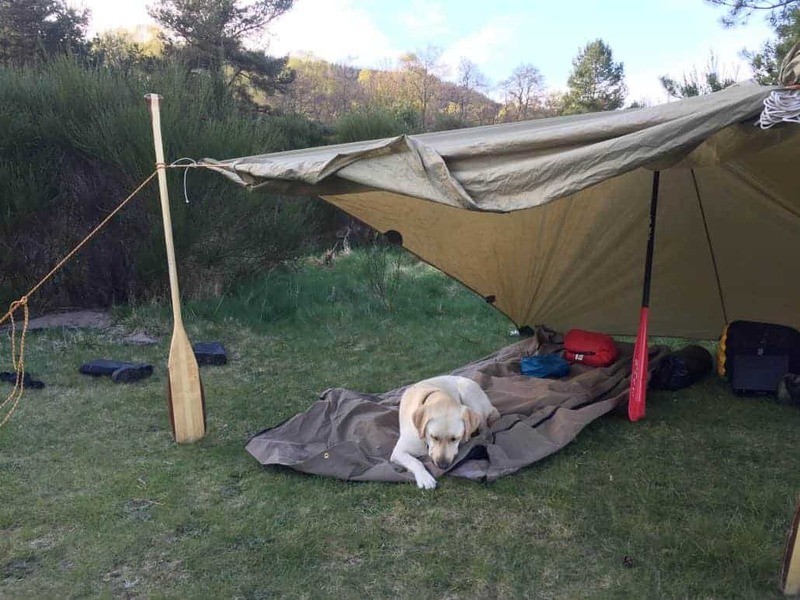 Our River Spey canoe expedition is a trip of a lifetime through the wilds of Scotland. For more details and to book your place on this trip click here. Your personal first aid kit should include any personal medication, painkillers, a standard ‘cuts kit’, blister kit and any other equipment that you might need, taking into account, of course, your proximity to civilisation. This one should really go without saying, but just in case it doesn’t – be sure to take with you a complete sleeping system, whatever that might look like, including sleeping bag and Thermarest/Karrimat or equivalent. 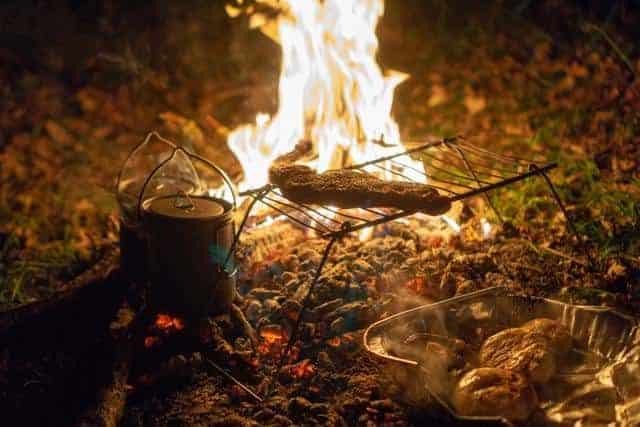 We’ll touch on cooking in more detail later in this blog, but when going on a long distance canoe trip you need to consider your cooking options. Small gas or meth stoves are ideal for evening meals and coffee in the morning, but if you’re going to be around open fires and in a large group then a Dutch oven or two can be the way to go. A personal wash kit is an essential when out in the wilds for any amount of time. Include, at a minimum, toothpaste, toothbrush, biodegradable shampoo and soaps and a small towel. Sunscreen can also be a good idea. A buoyancy aid is a must, choose one that has pockets in that can be used for storing your personal survival kit. 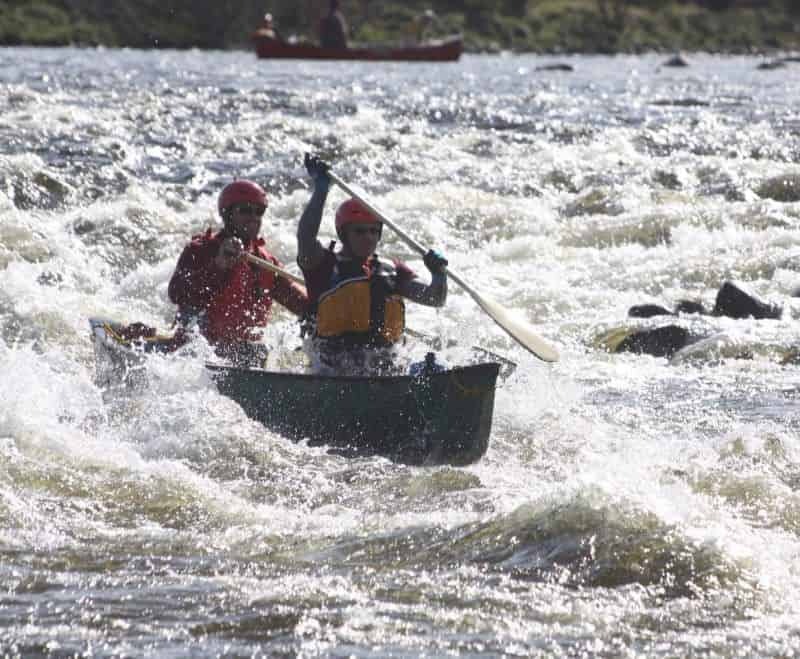 A helmet is also a must, particularly when rapids are involved. Also be sure to pack knee pads, or an old karrimat to kneel on and (of course) your paddle! 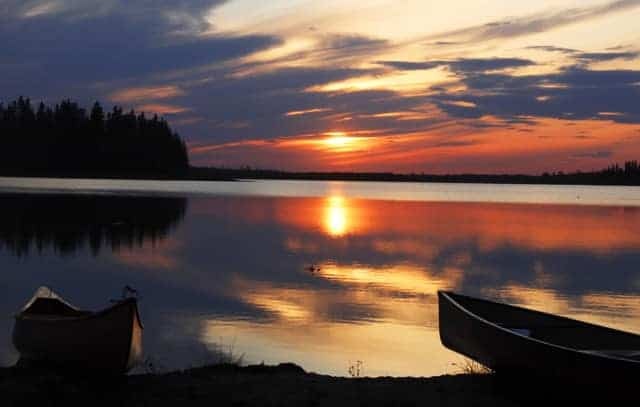 Of course, like a long hiking trip, a long canoe trip has an extensive and changing kit list that alters based on the season and location of your activity. A few other things that we suggest include dry bags, mosquito spray, and a bug head net. Wild camp along the banks of the river Spey. To find out more details and to book your place on this trip click here. For this section of the blog, we’ll be looking at meal planning on our River Spey canoe trip. Each night of our trip we will be wild camping along the route, the trip is self-catered – so you will need to bring your own food. Obviously, any fresh food that you decide to bring will need to eaten first – before it spoils. Longer trips will need dried and/or dehydrated foods (just add water), dry foods – such as lentils, pasta, etc. , and smoked/dried meats such as salami/chorizo. The last thing that you want to be doing when you’re out on the river is to have to stop and spend hours making lunch in the middle of the day. When it comes to lunch, pack high-energy foods that can be easily assembled and consumed without the need to stop on the shore. Measure out the portions of meals such as bannock bread, biscuits or loaves of bread and store these mixed measures in zip lock bags. This means that all you need to do when it comes to cooking is add a bit of water. 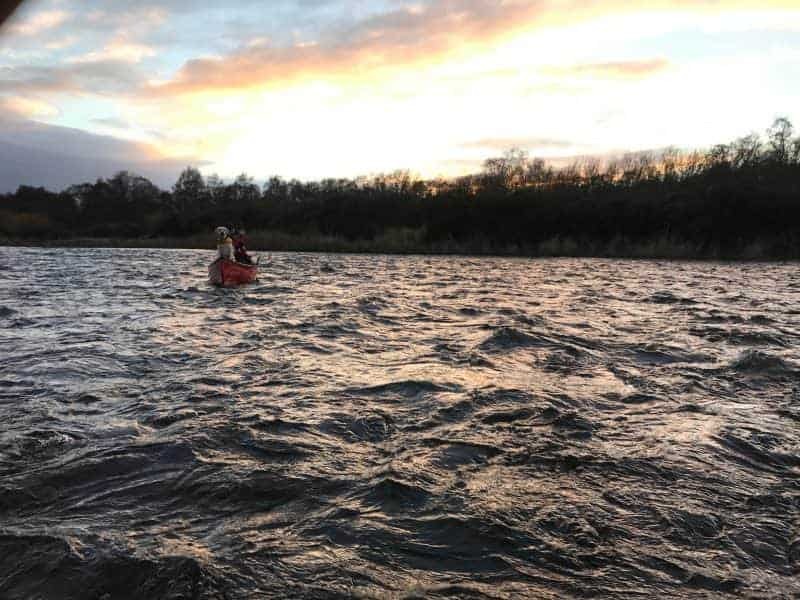 No matter your level of ability our experienced and trained course leaders will provide expert tuition while you canoe the river Spey. Let’s look at what you need to keep your kit dry across the length of your canoe trip. Wet kit can not only ruin a trip but could also quickly turn it into a survival situation. PVC tarpaulin dry bags are an essential part of any paddlers kit. Available from a number of manufacturers in a variety of sizes dry bags can be used to store all sorts of kit on your journey. Dry barrels or dry drums are fantastic ways of keeping your kit safe when out on the river. It’s worth separating your kit in these barrels out and wrapping it in plastic bags or the like in case anything wet is placed in the barrel (wet clothes for example). These waterproof barrels can be picked up on sites such as eBay for not too much money, just make sure that the lid is ‘locked’ on with a lockable metal strap. When it comes to packing for a long distance canoe expedition it is important to get it spot on as everything you will need for the trip will be in the boat. Here are a few key considerations when packing your boat. Pack your kit low and along the centre of your boat, if possible always try to pack your boat while it is in the water, this will help you see the impact of the weight of your kit. If the water that your paddling is going to be calm then you can get away with just throwing your bag in the bottom of the boat. However, if you’re expecting it to be a little choppy then leashing it to the seats or any part of the boat can be a good idea. Lashing your kit to your canoe also enables you to move it around and change the way the weight is distributed across the canoe. For really rough going then you’re going to need to lash your kit to the bottom of your boat. Remember, keep a knife handy in case you need to cut the rope. Store your kit in a logical manner. Keep elements that you are likely to need, (such as lunch or a first aid kit) within easy reach. Navigation equipment, signaling devices and the like need to be kept near to hand. Canoe the spectacular Scottish Highlands, join us on our river Spey expedition. Cooking for several people while at camp can be difficult task whether you’re cooking over a fire or a stove. 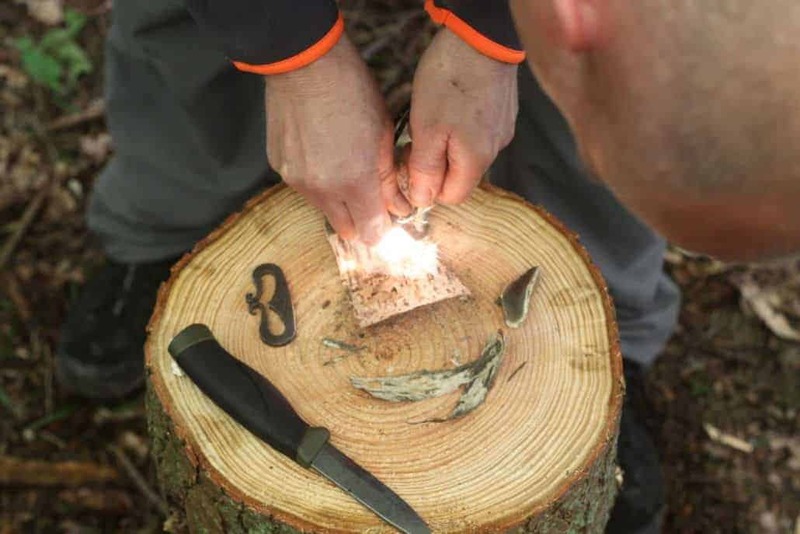 In this blog, we talk about how to make cooking at camp easier; show ways to improve the efficiency of your stove and show you some bushcraft techniques. Tarps are a lightweight and extremely versatile alternative to tents. In this blog, we look at setting up a tarp for the solo camper, tarp set-ups for couples and hammock camping for individuals and groups. Read on to find out more. 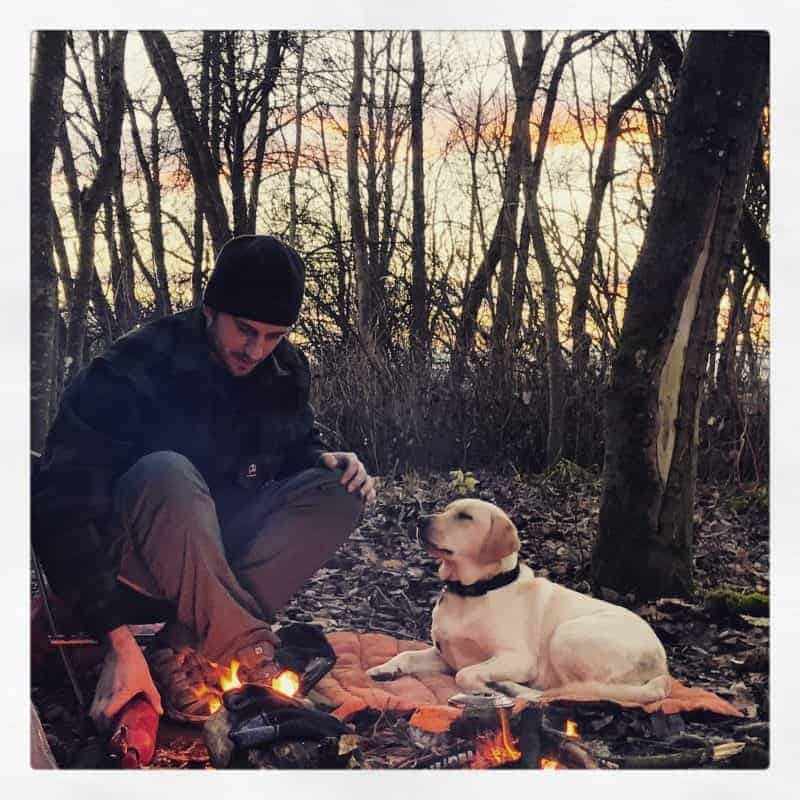 Organising your camp, whether you’re practising bushcraft, wild camping or even just at a campsite, is essential for keeping your food safe, morale up and your fire burning throughout the night. Read this week’s blog post to find out more or just skip straight to the section that you’re most interested in. How to choose the best place to build a shelter? What makes a good wild camping spot? How can I choose a good campsite pitch? These are all questions that are answered in our latest blog. Read on to find out more. Our next big expedition of 2017 will be the River Spey Bushcraft Canoe adventure in May. Renowned for its fishing, the River Spey is the ultimate destination for many returning Atlantic Salmon. Hatching from eggs in the cool tributaries of the highlands, the juvenile Salmon known as ‘parr’ then travel downstream to the coast. The growing fish t ypically spend one to four years at sea, often travelling to an area just off West Greenland in search of food. On reaching maturity, the Salmon will then return to their river of origin to spawn. 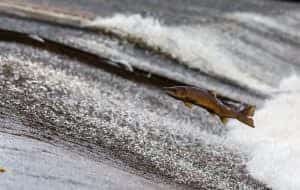 Unlike certain Pacific species, Atlantic Salmon do not routinely die after breeding, meaning that some fishmay undertake multiple migrations in their lifetime. 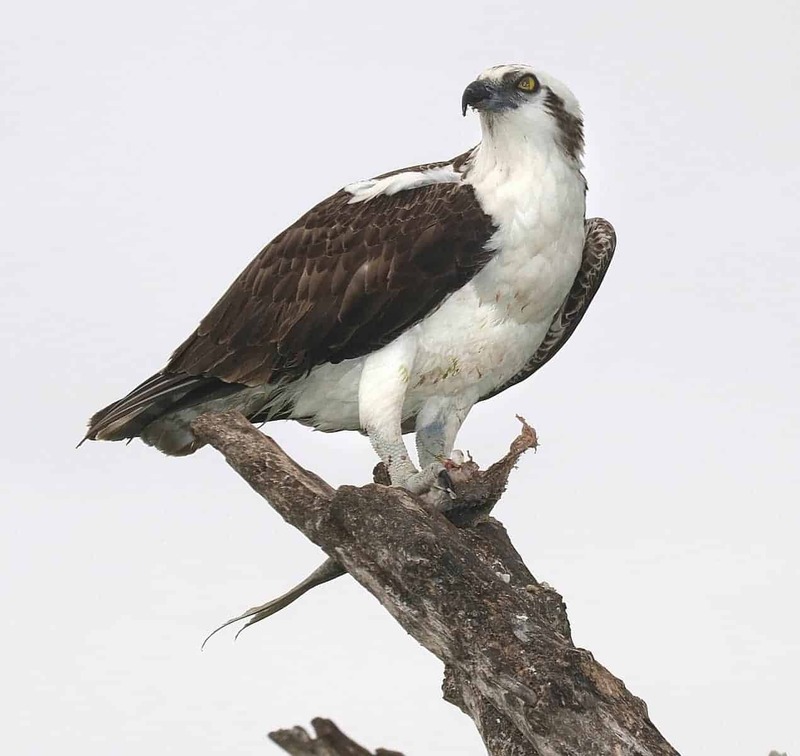 As you paddle your way down the Spey, you might be fortunate enough to spot the agile Osprey in action. Returning from their overwintering grounds in southern Europe and North Africa, these striking black and white birds are specialist fish-eaters, plunging talon-first into the water to capture their prey. Reaching a metre and a half wingspan, Ospreys hold Amber Status on the RSPB’s Red List, making them a rare but beautiful sight on UK rivers. 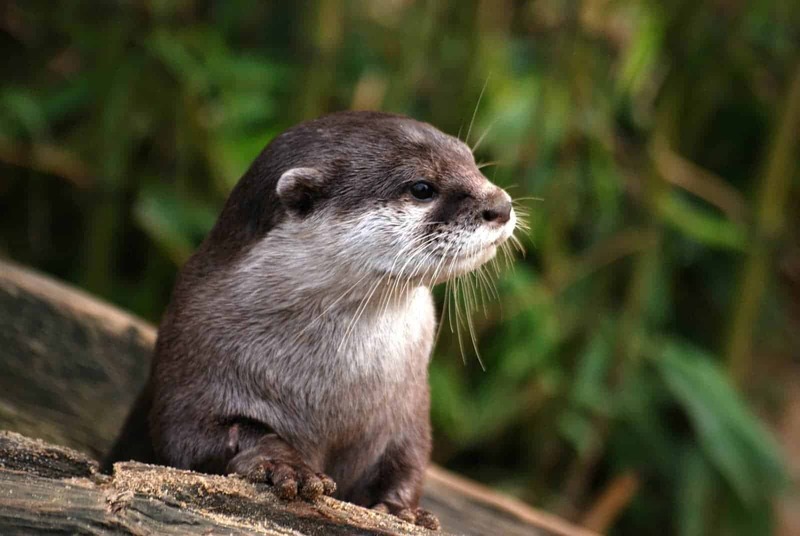 Take a walk along the riverbank during one of our wild camps and you might spot signs of one of the UK’s most elusive animals, the Eurasian Otter. Persecuted almost to extinction in England, Scotland has long been a stronghold for these enchanting animals. Feeding predominantly on fish, Otters are strongly territorial, coming together only during the mating season. Cubs remain with their mother until 13 months old, learning the skills necessary to go it alone in the waterways of Scotland. Drawing closer to the estuary of the River Spey, you’re likely to come under the scrutiny of the local Grey Seals. 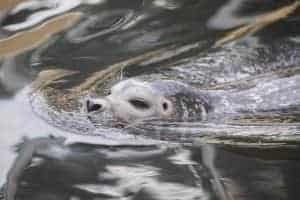 Equally comfortable in salt and brackish water, Grey Seals are the UK’s largest carnivore, weighing up to 310kg. Though bulls can occasionally be aggressive, most seals are cautiously inquisitive, with some friendly enough to attempt a lift on passing kayaks! As you near the end of your canoe bushcraft adventure, you’ll reach the coast at Spey Bay, home to the world’s largest Bottlenose Dolphins. 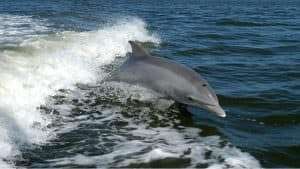 Attracted by the Spey’s wealth of Atlantic Salmon, Bottlenose Dolphins are gregarious and intelligent, living in family pods of up to thirty individuals. The most common oceanic dolphin species, the Spey Bay pod are well known for showing off their acrobatic skills. Should you wish to learn more about these remarkable animals, the Scottish Dolphin Centre at Spey Bay offers talks, tours and a unique audio-visual installation (www.wdcs.org). Interested in encountering wild Scotland by Canoe? 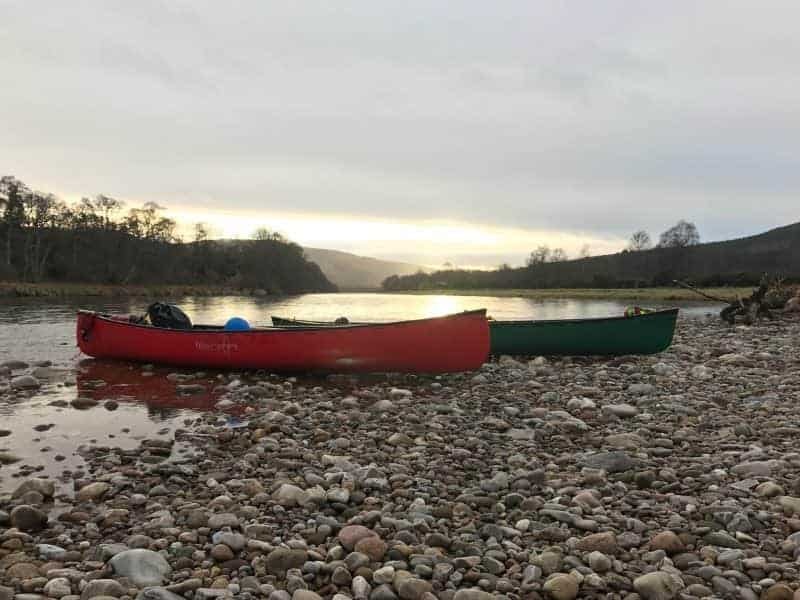 Find more details of our River Spey Canoe Bushcraft Expedition here; If you need to know what we take away with us on these trips check this post out. 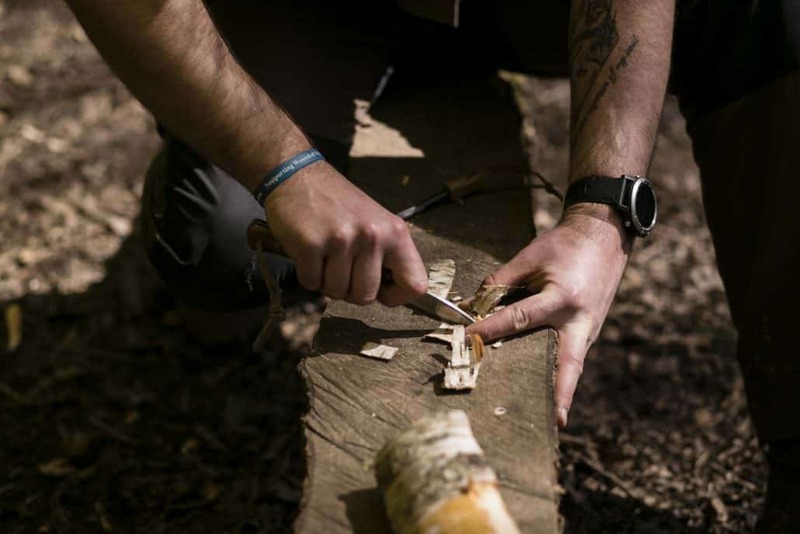 Bushcraft Kit – 10 Items to always take with you. Now, I have been guilty of a never ending collection of bushcraft kit- a bag for this, a knife for that, more axes than I could ever use, and as for billy cans, why do I need so many pots and pans? So I thought I would sit down with a brew and try to help others avoid the same pitfalls. Knife- a good knife is a must but a good knife does not mean an expensive knife. A Mora Knife will see you through every job you could want to do out on your trips to the wild. At around £12 it’s a no brainer, it’s simple and a joy to use. If you want to fork outmore money then you can find some very nice knives being hand made by some very talented makers out there. If you’re going to buy an expensive knife, I would suggest one with a full tang and a Scandi grind to ensure it lasts a life time. Saw- a small folding saw makes life so much easier in the woods. Not only is it more efficient but it’s kinder on the tree if you’recutting green wood. I use a Baco Laplander, they are around £15 and I have never had a problem with mine. They come in woodland green and black so I tie some orange Paracord on to mine so it’s easier to find should I drop it or place it down on the ground. First Aid Kit– where my knife goes so does my “ouch pouch!” Often over looked, this should be one of the first things you pack. Mine contains plasters, cleaning wipes, Compeed blister plasters and the like. There are some good ones of the shelf you can buy but it will be cheaper to make one that suits your needs. The most important thing is you have one with you. Tarp’- I use a light weight DD 3×3, which packs down really small and fits in to my day sack. I always take it with me in case of heavy rain and can be put up in a couple of minutes. I attach about 4 m of Paracord to each corner and then shank it up so it’s tidy and out of the way. Top Tip- take a stuff sack so you can keep the rest of your kit dry if putting a wet tarp away into your kit bag. DC4– my little sharpening stone is a must take item. It is perfect for touching up my knife’s edge whilst in the woods. I really have not found anything else that does the job as well. Billy Can– I use a 12cm Zebra Billy Can, with this I can cook in it and eat out it of but most importantly I can boil water for my brew, I don’t do well with out tea! Fire Steel– my main way to start fires when I am out and about, I have used lots of fire steels in the past and with out a doubt the best one I have ever come across, and still use today, is the Light My Fire Army version. I have found that it just works the best out of every one I have tried. This is one bit of bushcraft kit I just want to work, it’s that simple. Whistle– I always pack a whistle, it’s a simple thing but I won’t head out on a trip without one. It’s a great way of gaining attention should I find myself in an emergency situation and need to get help. My bushcraft kit always has a spare tucked away. Tinder– just because you can find tinder in the wild, does not mean you should use it every time you need to light a fire. The UK is a small place so I don’t like to use up natural resources unnecessarily so I always carry some pre sourced tinder. Be it cotton wool or Birch bark, or a bit of fat wood, it’s just sensible to have some dry “go to” tinder all ready when you need it. Brew Kit– last and by no means least, TEA, SUGAR and COFFEE MATE. I need tea to survive. I am part Zombie without a good brew in the morning! Like I said at the start, this is my top 10 “never leave for a trip without” list. You will able to add to this, but the most important thing is to enjoy the wild places you visit and learn and have fun. Right, kettle has boiled, so I am off! 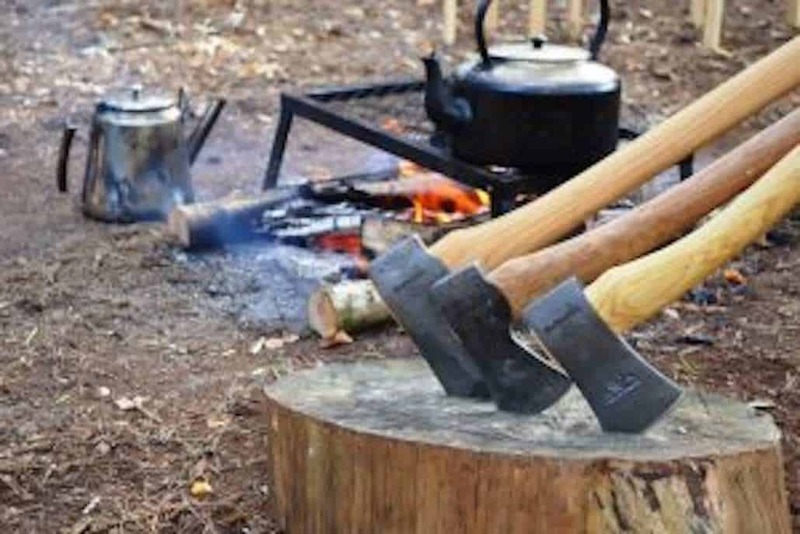 John https://www.wildwaybushcraft.co.uk/wp-content/uploads/2014/10/Wildway-Bushcraft-header-300x71.png John2016-11-23 20:16:572017-03-15 16:39:19Bushcraft Kit - 10 Items to always take with you.